Nanolinux is an open-source, free and very lightweight Linux distribution that requires only 14 MB of disk space. 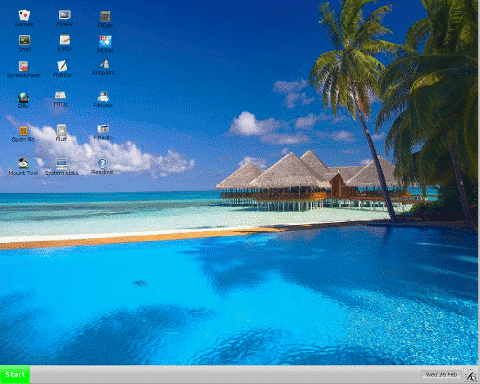 It includes tiny versions of the most common desktop applications and several games. It is based on the "MicroCore" edition of the Tiny Core Linux distribution. Nanolinux uses BusyBox, Nano-X instead of X.Org, FLTK 1.3.x as the default GUI toolkit, and the super-lightweight SLWM window manager. The included applications are mainly based on FLTK. Rate this project The proud announcement has been made, but it's rather too official so let me quote MandrakeForum instead: "Proudly presenting: the best Linux distribution in the known universe! It's also known as Mandrake Linux 9.0, code name 'Dolphin'. It's hot, it's cool, it's something that will make your Windows-running friends turn green from envy. ;-)" That's more like a cork-popping presentation of an exciting release! So congratulations and thank you, Mandrake! Now, the next question on everybody's mind is where to find a fast mirror. Or any mirror. If you are lucky, try this one: Mandrake90-cd1-inst.i586.iso (695MB), Mandrake90-cd2-inst.i586.iso (700MB), Mandrake90-cd3-i18n.i586.iso (456MB). It's not just the mirrors, even the web site of the world's most popular Linux distribution is hard to access, but here are all the important links: press release, the Mandrake 9.0 page with lots of screenshots, mirror list and Mandrake Store: Standard Edition (US$30), Workstation DVD (US$59), PowerPack (US$69) and ProSuite ($199). Have fun!